. For patients requiring comfort or at risk for skin irritation. . 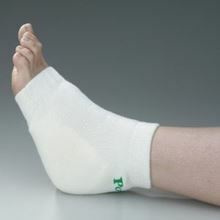 Comfortable sock-like covering helps provide comfort and helps protect against limb friction and shear forces. .
• Flexible stretch yarn helps minimize friction and shearing on the skin. • Non-compression, expandable knit weave helps promote air circulation. • Sewn-in contoured soft-open cell foam pad located at the bony prominence's of the heel and elbow. Knitted Heel/Elbow Protectors are intended to fit as a comfort product. Actual fit will depend on individual anthropometric measurements and patient comfort level. These protectors will stretch up to 30%. Green heel/elbow protectors, sold as 1 pair.